The 20 best lunch spots in Hollywood. Some things are just undeniable. Real has to recognize real. And we can certainly recognize good food. Excellent food. Some of the best food in the city, actually. So when you pull into this tiny strip mall and try to figure out how this tiny room is serving up food that has the entire city talking, please try to ignore the nagging feeling that the concept just doesn’t make any sense. You’ll understand after your first bite. Well, sort of. 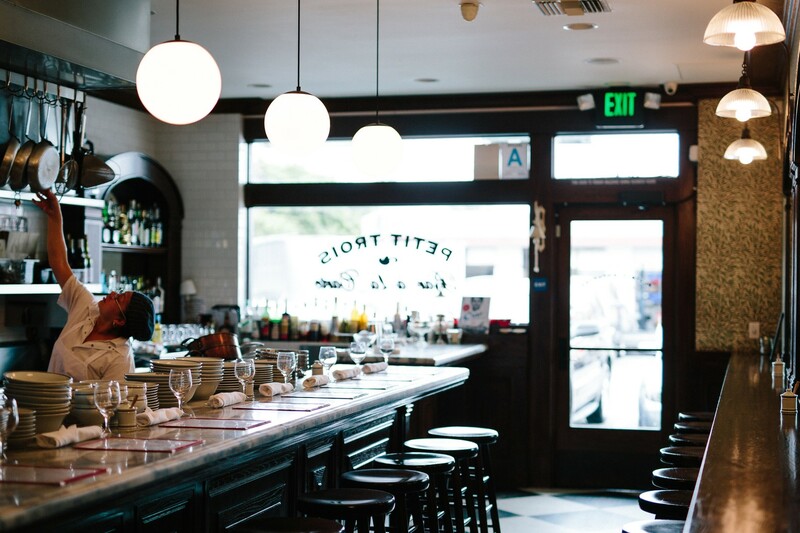 Petit Trois is a French bistro playing the workman lunch counter game. As in, there is only a counter. No tables. Not even one. When you finally get one of their twenty-ish seats, you'll either find yourself facing the open kitchen or staring directly into a f*cking wall. And why doesn’t this place take reservations? We’d love to say this is an effort to level the playing field. We’d love to say that this announces to the world: “We don’t care who you are – come eat.” But the buzz, and let’s face it, the price was never going to allow for that. Instead, it teases with a cool idea, delights with great food, and leaves you with the feeling that it could have been more. It’s true. You’re not going to find a better meal in Los Angeles without a reservation (or a ticket, like this crews' more adventurous Trois Mec next door requires). So be prepared to wait. It’s worth it. But if you’re expecting something revolutionary, you’re going to be disappointed. Instead, you’ll find another expensive restaurant serving up wonderful food, but with the added bonus of having to wait for an hour for a seat at the bar. But that food, though. Seriously, that food. It feels counter-intuitive, praising a dish for what its not, but we mean this in the best way possible: this sh*t tastes cooked! It's also made us suspicious that every other tartare dish we’ve ever had was just plain made wrong. Generally a salad next to a fried chicken leg is just there to make you feel better about yourself. Not here. This salad was an essential part of the dish, balancing the crispy, rich chicken with a light touch. A real must-order. A visual masterpiece that tastes as smooth as it looks. Add in a healthy helping of God’s gift to man, Boursin cheese, and you’ve got a damn perfect omelette. Creamy, melty, deliciousness. Cheese, cheese, and mornay sauce, which is cheese, plus thin slicing of ham, mostly just to convince yourself you’re not eating a bowl of cheese.